OKLAHOMA CITY (AP) — The Thunder were foundering without their star point guard, and the Miami Heat — like Oklahoma City trying to improve their playoff position — took advantage. 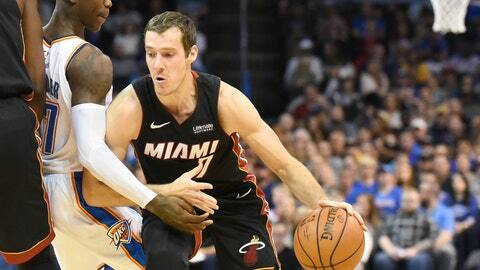 Goran Dragic had 26 points and 11 assists, and Dwyane Wade added 25 points in the Heat’s 116-107 win Monday night over the Thunder, who played without the suspended Russell Westbrook. “We put our track shoes on, put all our pads on and went out there ready for a tough basketball game that has a playoff kind of feel to it,” said Wade, who played 33 minutes. Paul George scored 31 points with nine rebounds and Jerami Grant had 27 points and 10 rebounds for Oklahoma City. Dennis Schroder, who started in Westbrook’s place, scored 20 points. Steven Adams had 10 points and 12 rebounds but was limited by foul trouble to 25 minutes. Without Schroder running the second unit, Oklahoma City’s bench lacked scoring punch and it showed, as Miami’s reserves outscored the Thunder’s 67-10. Dragic and Wade both came off the bench for the Heat, and reserve James Johnson had 14 points. The first half featured wild swings. The Thunder led 13-0 after the Heat missed their first eight shots, but a 17-0 run by Miami’s reserves put the Heat ahead before the end of the first quarter. The Heat led 41-29 with 8:12 left in the second quarter, but Oklahoma City pulled within 58-55 by halftime. Miami rebuilt its lead to 15 points in the third quarter. A dunk by Grant with 11:02 left got the Thunder within 86-79 before a 15-3 run by the Heat ended all doubt. A 3-pointer by Josh Richardson — who is from the Oklahoma City suburb of Edmond — put Miami up 101-82 with 7:29 left. “They hit some tough shots,” Schroder said. “We forced them to shoot non-paint twos and D-Wade and Dragic did a great job tonight. Credit to them. Heat: Justise Winslow missed his second straight game with a right thigh bruise suffered Friday against Milwaukee, while Rodney McGruder sat out with left knee soreness. … Former Thunder player Dion Waiters received louder-than-usual applause as starting lineups were introduced, but Wade received a standing ovation when he entered four minutes into the game. … Wade’s 674 career points vs. the Thunder is his second-highest total against a Western Conference foe, behind only Portland (699). Thunder: Westbrook could earn another one-game suspension for every two technical fouls the rest of the regular season. He’s now missed nine games this season because of injury or suspension. … Backup C Nerlens Noel didn’t play because of a left quad contusion. … Markieff Morris picked up a technical foul with 1:40 left in the third quarter.